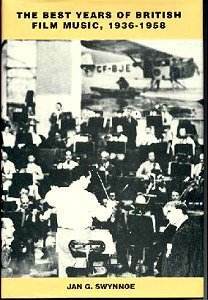 It is true that some of the most memorable British film scores were written by many of our leading composers in the period 1936 to 1958. One thinks immediately of beacon scores like: Bliss�s Things To Come, Vaughan Williams� inspiring score for The 49th Parallel and his evocative Scott of the Antarctic and Walton�s three Shakespearean scores: Henry V, Hamlet and Richard III and his music for The First of the Few. John Williams has observed that Walton was highly regarded by the American film music fraternity. Ms Swynnoe, who is described as a pianist, percussionist and composer, looks at this period before the rise of the American quota movies filmed in England and the advent of British kitchen-sink dramas and before audiences deserted the cinemas in favour of cosy fireside TV. Generally, she paints a bleak picture of the British film industry: often, with a few notable and brilliant exceptions, producing films debilitated by low budgets, and stilted and class-conscious stories and buttoned-up acting. Music written for films, in those days (nothing much has changed) was generally regarded by critics and the musical establishment as inferior and often major British composers were dragged reluctantly into the studios. The difficulty I have with this book is that Ms Swynnoe cannot resist parading her many prejudices and in doing so presents a totally distorted picture of the world of film music. She disparages Hollywood�s essential contribution, belittling the accomplishments of Steiner and Korngold (with little or no mention of the other giants of the Golden Age like Waxman, Tiomkin, and Herrmann etc), rubbishing the over-use (?) of leitmotivs and the habit of mickey-mousing and general lack of subtlety. Somehow I wonder if she has really troubled to listen widely and study enough American film music of this period. She practically dismisses all the music written for the marvellous and colourful Korda films made at Denham in this period, especially by Miklós Rózsa. She can find no merit in Rózsa�s fine The Four Feathers music for example � although she scores a small point when discussing its weakness as a support to non-action dialogue scenes. Another target is the music contributed by foreign composers. Georges Auric�s contribution is all but swept aside. To support her often tenuous arguments, she quotes from sources that are too often ill-informed or unsympathetic to film music, or both. But most objectionably her selected negative quotes from Christopher Palmer�s brilliant book The Composer in Hollywood gives a totally wrong impression of Palmer�s work, which accentuated the strengths of Korngold and Steiner etc. It is notable that Palmer was a great champion of not only British film music but also the concert music of many British composers, especially Walton and Delius and yet most of his work in the genre of film music was orientated towards Hollywood. (My concluding remarks below might suggest why.) Unhappily Swynnoe cannot resist diminishing Palmer�s reputation in an interview with Doreen Carwithen that forms Appendix II of this book. The book�s only strength is in its analyses of a number of British film scores well-known and not-so-well-known including such excruciatingly awful minor opuses like Once a Jolly Swagman and Waterloo Road. Swynnoe does make some valid points, useful for aspiring film composers, about how music used with subtlety and discrimination can enhance a screenplay particularly when intelligently used to support dialogue especially when it needs to reveal a character�s feelings that might be at odds with delivered lines. One of Swynnoe�s most interesting examples in this context is Lord Berners� music for the mystical ghost story Halfway House. One chapter is devoted to an analysis of the strengths and weaknesses of Sir Arnold Bax�s score for Oliver Twist, not by any means representative of the composer�s best music. It was written towards the end of Bax�s life when he was living in Sussex, and when his best work was well behind him � in fact the only really memorable theme from this film was lifted from one of his much earlier works, In Memoriam. Although the book is valuable in its discussion of the practical aspects of film music in enhancing and clarifying screenplays, Swynnoe seems uninterested in an important aspect of film music that of its ability to stand apart and to be appreciated on its own merits as music. And this is where I return to Christopher Palmer and the Hollywood composers. I am going to stick my neck out here. Dare I say it, but apart from the film scores quoted in my first paragraph and a few others by Brian Easdale, Malcolm Arnold (and certainly not his Oscar-winning score for The Bridge on the River Kwai, celebrated for that excruciatingly awful Colonel Bogey March) and William Alwyn (who wrote a few fine scores like Odd Man Out but too many others that are pedestrian), so much of British film music is frankly dull. So little of it is memorable, so little of it touches the heart and raises the spirit. American film music of this period does so in spades and that is perhaps why Palmer wrote about American film music first and collaborated in so many recordings of the music of Hollywood�s Golden Age as a first choice. One has to face the fact that there are far more recordings of American film music than British. This book does few favours for British films or British film music. In fact it puts back the appreciation of film music in general by years. Approach with caution.